A vinyl retrofit window is installed without the need to repair stucco, paint, or anything around the window. A traditional lead and bevel design on a sliding window with privacy glass over the tub. This vinyl retrofit window is part stationary window and part small sliding window. This large window has an obscured view due to the rain glass. This provides privacy while not blocking the outside light. 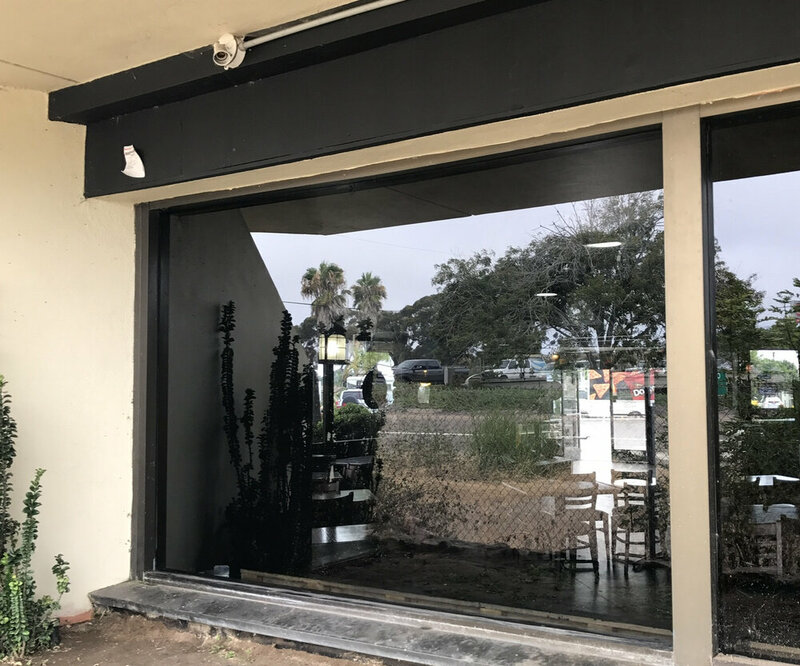 A very large custom storefront window installed to replace a broken window. Is your window glass broken? Have your windows failed and started to fog? Do you need a better way to block the sound or heat from the sun? Or is the view a little public? Whatever your window needs are, the Glass and Mirror Shoppe is here to figure out a solution! We can replace the glass in broken windows by carefully removing the broken pieces and installing new glass. If the seals in your window are failing, the Shoppe can also create a new dual unit to replace windows that are starting to fog or are damaged. If you are in an older home, you may be living with thin windows that let in the noise of the outside and the sun's rays. At the Glass and Mirror Shoppe we can provide Low E tempered glass that is stronger and thicker with the Low E deflecting the sun’s heat and the stronger glass cutting out the sound. This will also improve your homes insulation to keep down heating and cooling costs. A vinyl retrofit window will update the look of your home while minimizing the window replacement time. Vinyl retrofit windows add energy efficiency with bonus sound control. With none to little repair needed to paint, sheet rock, or stucco; this option comes with minimal contractor involvement or cost. Contact Glass and Mirror Shoppe here, call at (760) 729-1064, text us at (760) 390-2273, or email us at glassandmirror@icloud.com today and we will help you take care of your window needs!